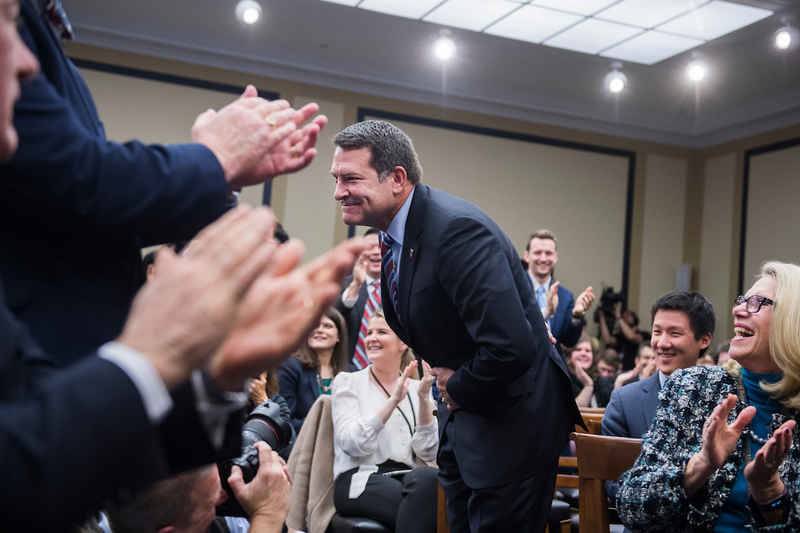 It got raucous in the Rayburn Building on Friday as Virginia Republican Ben Cline pulled the lucky number during a lottery for incoming members of Congress. The reward was a coveted one: first choice of office space. Packed with 85 freshmen, plus their staff and press, the room erupted when Cline pulled the top number, giving him his pick of available office suites. He flashed a big smile as he turned around to face the crowd. Fellow Republican newcomer Mark E. Green was not so lucky. Green will be the last to choose his office Friday afternoon after pulling number 85. His pick was met first with groans from the room, and then a standing ovation as everyone else realized they wouldn’t be the ones stuck with the worst office in the House. Which offices are best and worst is a subjective matter — some members value size, while others want a quick trip back and forth from the House chamber to save time between votes. Some offices have larger lobbies to receive visitors, while others have a grander space for the lawmaker’s personal office. The traditional room lottery draw, run by the Architect of the Capitol House Superintendent’s Office, requires every newly elected member to pick a numbered chip as they’re called by their last names in alphabetical order. As he kicked off the event, Superintendent of House Office Buildings William Weidemeyer told the incoming lawmakers that historically there’s been a correlation between good luck acts and the number drawn. “Gyrations, dances and visible praying are highly encouraged,” he said. The newcomers took the advice to heart. A handful performed the popular “floss” dance that’s a social media hit with kids and teens. Ayanna Pressley served as a cheerleader for fellow Democrats who were saddled with high numbers. “You’re still in Congress!” she emphatically reminded the room more than once, cutting through the “aww”s and groans. Before the process got underway, she broke out a modified Oprah impression. “You get an office, and you get an office, and you get an office,” she said, pointing at the backs of her colleagues’ heads in the rows ahead of her. She called upon an iconic former member’s good vibes, announcing as she approached the number-filled box that it was Shirley Chisholm’s 94th birthday. Chisholm was the first black woman ever elected to serve in the House. Pressley is the first black woman to represent Massachusetts in Congress. She said that with number 38, she’d be checking out which offices Chisholm had held to see if she had any chance of landing there. “Is there a Democrat with a rosary here?” asked Iowa’s Cindy Axne, before drawing number 54. Not bad, but maybe she should have brought her own beads. “That’s how we do in Detroit!” said Rashida Tlaib after she drew number 8 — an enviable position. Colin Allred was first to draw and came up with number four. Later, his fellow Texas Democrat Lizzie Pannill Fletcher gave Allred her number 56 chip, his jersey number when he played in the NFL for the Tennessee Titans. When they stake their claims to their offices Friday afternoon, most of the freshmen will end up in Cannon or Longworth. Less than 20 freshmen have scooped up a place in the Rayburn House Office Building over the past decade. Six computers stood along one wall for staff to search an internal House system with maps of the office buildings. Selecting an office suite pulls up photos showing the views from the windows and images of the inside of the offices.